One of my DESIRES is to compose music that is naturally accessible to all, ideally shedding any labels that tend to categorize contemporary big band music as intellectual, inaccessible or just plain “out.” I strive to create moments of aural bliss, or wonder, and to illustrate a grateful openness to the mysteries and joys of life. While recording this CD, I was lucky enough to experience some of the JOY – there were moments when it was challenging to continue to play, because I was awestruck that this was actually happening: 18 people were making music from some dots I had written down. During rare moments like these, I feel very free – playing becomes easy and most importantly I feel like ME – sure that this is what I was meant to do, and these are the people I was meant to do it with. Creating this album with jazz bigband graz has enabled me to delve more deeply into the concept of a new “big band sound”, starting with the traditional instrumentation [augmented with cello, synth and Theo Bleckmann/voice] and completely leaving behind the traditional forms of big band composition, I have never been moved to incorporate shout choruses, sax solis, or other traditional big band arranging techniques – my inclination has always been toward using the energy and power that are inherent in a band of 18 musicians – appreciating the force of 18 musicians playing in unison or the subtle impact of having the entire band whistling like a bird. The opening trace, “The Bird With The Coppery Keen Claws”, is a way to welcome the listener to a journey mapped out through sound…a way to say right away that this is not your parents’ big band cd. 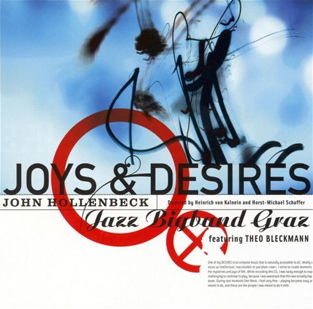 I arranged “The Joys and Desires Suite” [tracks 4-6] specifically for jazz bigband graz, knowing that these musicians would re-create the music as I had imagined it. The title comes from the last line of William Blake’s poem “The Garden of Love”: “and binding with briars, my joys and desires” [track 6]. I remember searching for a text that moved me – I was immediately inspired by Blake’s poem and knew I had the perfect outlet in Theo Bleckmann to recreate the poem with music. This suite represents a musical exploration of the experience of joy and desire: #1 “Jazz Envy” focuses musically more so on desire and the conflict and struggle that results from desiring to be a part of the “jazz community”, whereas #2 “After A Dance Or Two, We Sit Down For A Pint With Gil And Tim” is about dancing, drinking, talking, Tim Berne, drinking, Gil Evans, joy, drinking [not that I honestly know very much about drinking]… #3 “Garden of Love” presents both ideas most directly through verse. Maxfield is inspired by the American painter, Maxfield Parrish, who made his way into my life and eventually my music. When I was about 18 and studying at the Eastman School of Music, I discovered a Parrish original in Eastman Theater – I told my dad about it and he produced a book about Parrish which I come back to again and again. While art is even harder to write about than music, in simplistic terms, Parrish has a beautiful talent for painting trees, skies, clouds, the color blue, which is why I included a little mantra at the the end of this piece with some of those words. “Just Like Him” uses the pitch material from a song an old girlfriend wrote entitled “Just Like Her” – the 4 bar vamp that is the foundation of “Just Like Him” is borrowed from the intro of her tune. This girlfriend was jealous and at times, paranoid: which is the state I think she was in when writing “Just Like Her”, a tune apparently about one of my previous girlfriends and my supposed continued affection for her. I really liked the intro to her song, although the rest of the song was a big disappointment. So after she dumped me, I didn’t feel bad about rearranging her intro material until I was able to create the opening section of “Just Like Him”, which is in my opinion, bigger, badder, faster, and longer than my old girlfriend’s tune. During my first years in NYC, I was thinking about abstinence [as sensitive men do], sometimes practicing it willingly and other times quite unwillingly. I liked the structure of the word abstinence and though I could come up with a melody that was related to its letters. The letter-melody I eventually came up with is the recurring statement that the bass opens the piece with. From there, I created the counter-melody and then decided it would be nice to take a break from abstinence and have a song-like refrain integrated into the tune as well. The entire composition reflects both those periods of willful and imposed abstinence, as well as those periods after abstinence [AKA: the party!] through the varied use of these three basic themes. With music that is so intentionally ensemble-based, I am reluctant to even single anyone out, but I must mention Henning Sievert’s remarkable cello playing which creates an intimate chamber dimension to the music throughout this recording. Also Klaus Gesing’s beautiful soaring saxophone on “Garden of Love” and “Maxfield”, two arrangements that I wrote with him specifically in mind, knowing he would create the atmosphere I was aiming for…[I think we were both Capuchin monks in a previous life]. Listening to this CD for the fiftieth time, I am still amazed at the structure, flow and texture of Uli Rennert’s synth solo in “Jazz Envy”. I would not want to play this music without my best friend, Theo Bleckmann: his versatility, unabashed musicality, and exceptional ability to express the vulnerability of being human are vital elements in this music.